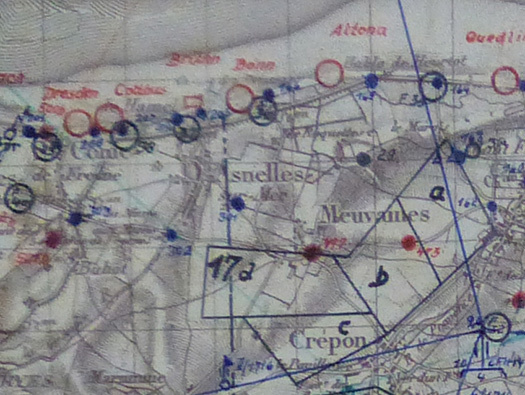 Wn38 St-Côme-de-Fresné, la Guerre, K.V.U Gruppe Bessin, K.V.Gr Bayeux. 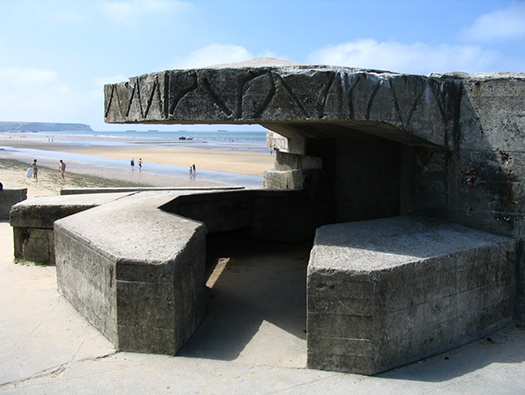 Situated on the coast to the East of Arromanches-les-Bains. 1 & 2/916. 352nd Div. 1 x Ringstand 5cm le.Gr.W.36 mortar. 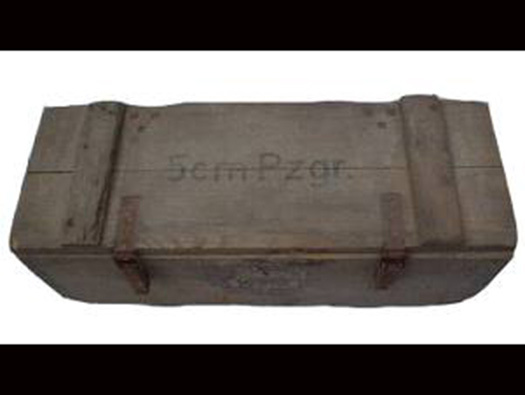 1 x 5cm le.Gr.W.36 mortar. 1950's air photo showing the position very well. 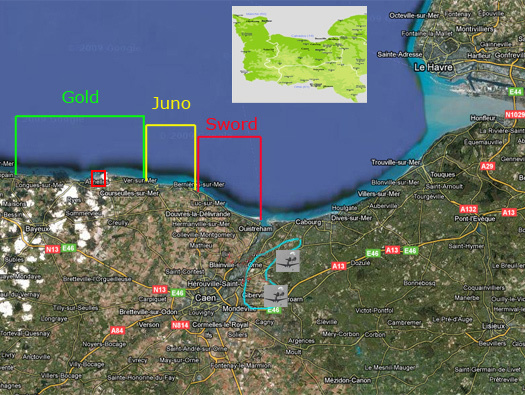 Plan of the defences in the area of Wn38. 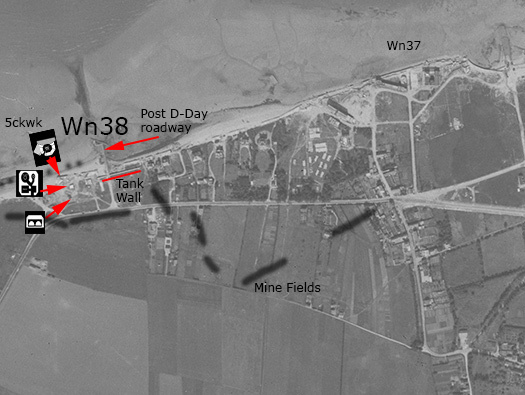 Minefields surrounded the Wn with Mf.1 on the sea front and Mf.88 covering the rear and inland fall back Wn's of 40 & 41. 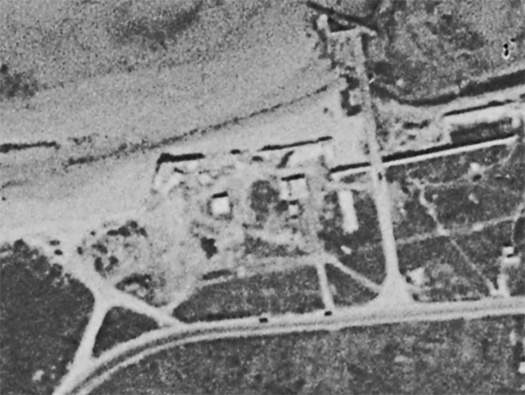 Coblens is the target name for the beach in front of Wn38. Coblens is the pre-1926Â German spelling). This is the area called 'la Guerre' the rear of Wn 38 and on the German artillery map its No.207 as a target if needed and it was. 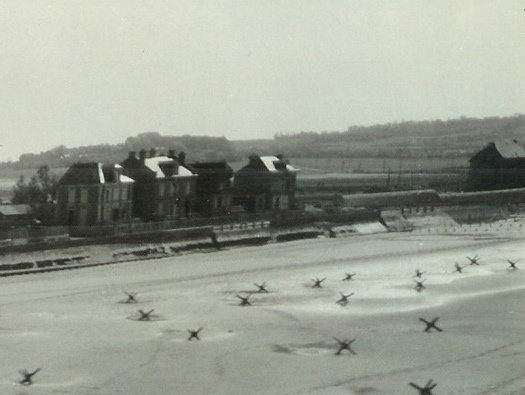 East Yorks under shell fire. 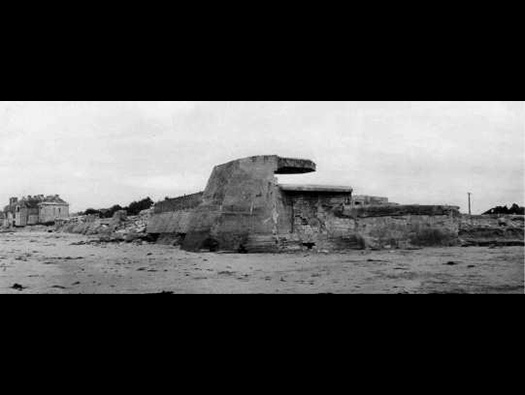 Machine gun bunker with two embrasures, they are very like the ones on Omaha Beach. 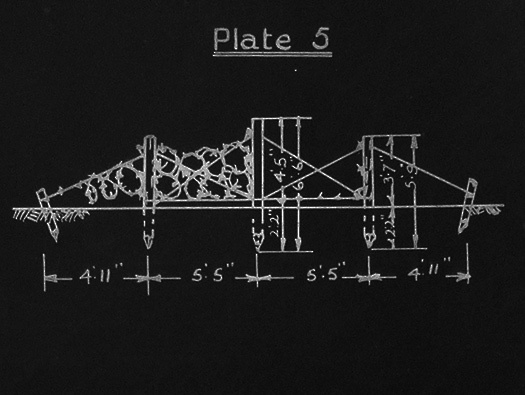 Plan of this type of M.G. 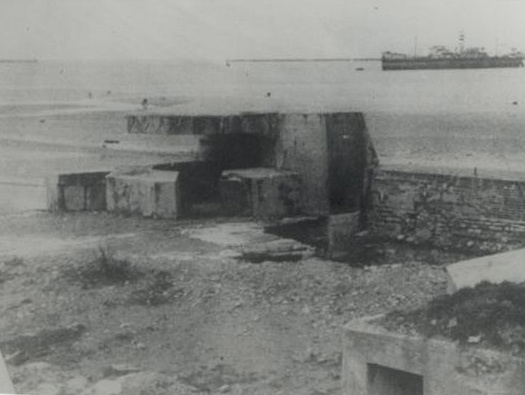 bunker. 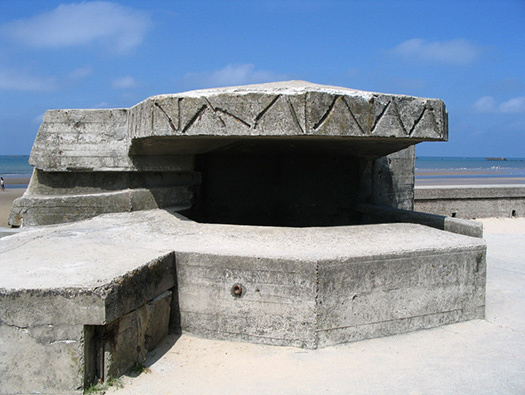 Machine gun bunker with two embrasures. 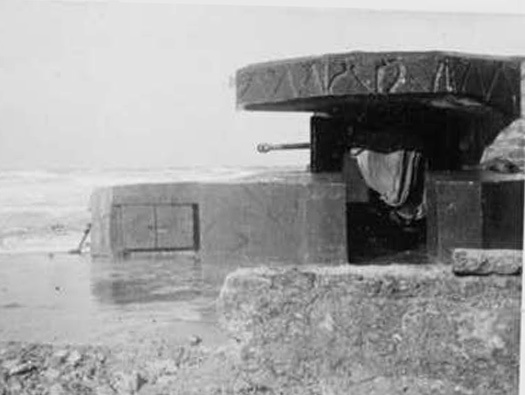 Nr1694 ringstand for a 5cm KwK modified to cover the gun from attack from the sea. 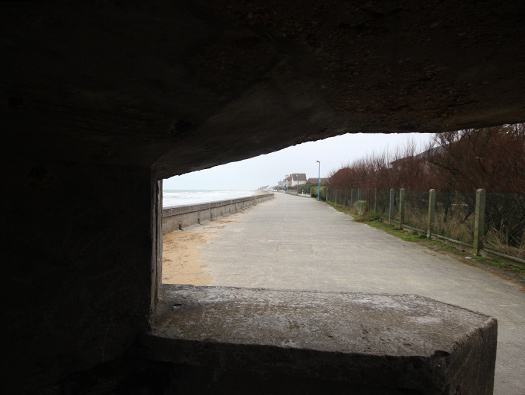 The view from Wn40 Arromanches. 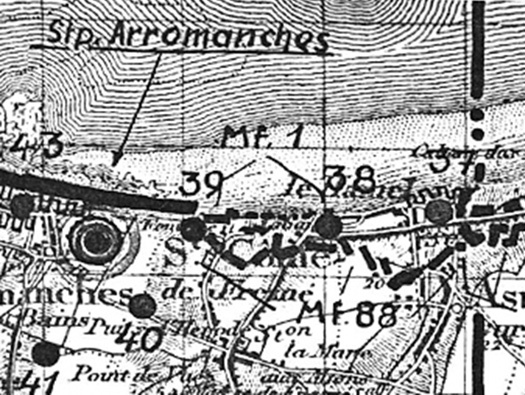 An Allied plan of an Nr.1694 with its concrete cover. Nr.1694 with its concrete cover. 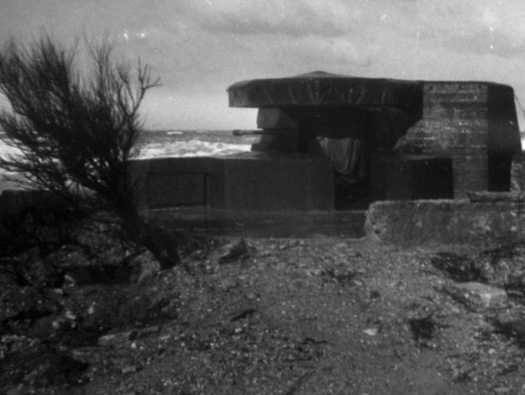 Note the small ammunition niche with hinged concrete doors. 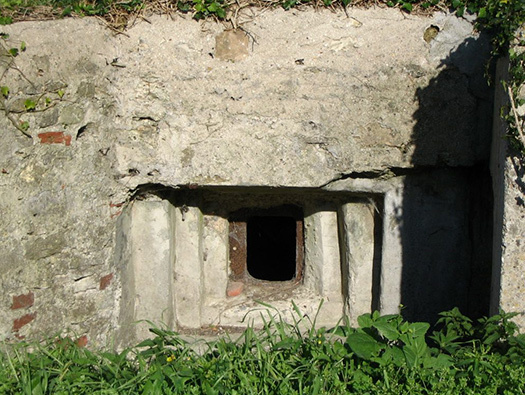 The small ammunition niche today. The view along the coast. 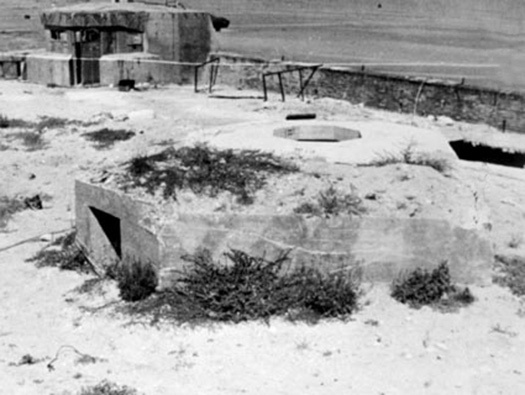 A post D-Day photo of the ringstand with the gun still in place and set in its protected slot in the wall. 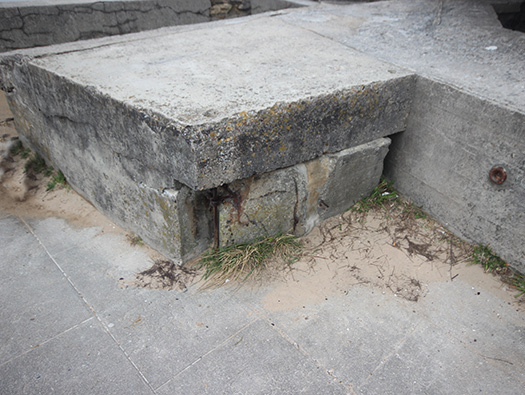 Ringstand now showing the slot where the gun could slot to protect it from gunfire and the ammunition niche with its concrete doors. The slot on the right side is for access into the ringstand. Post D-Day possibly post Wartime and the gun has now been removed. 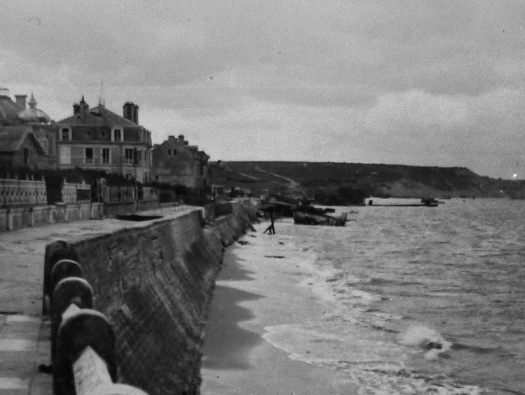 The very strong concrete wall covering the sea side. Nice picture from the sea. 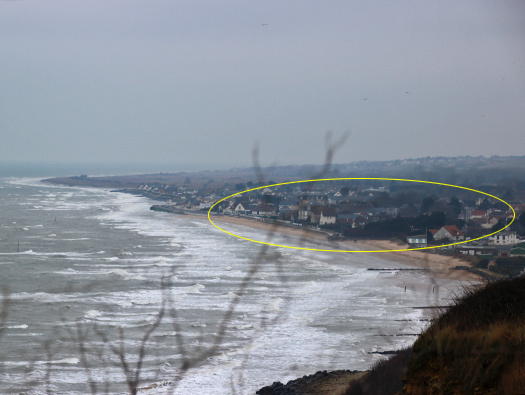 The view up the beach looking east. 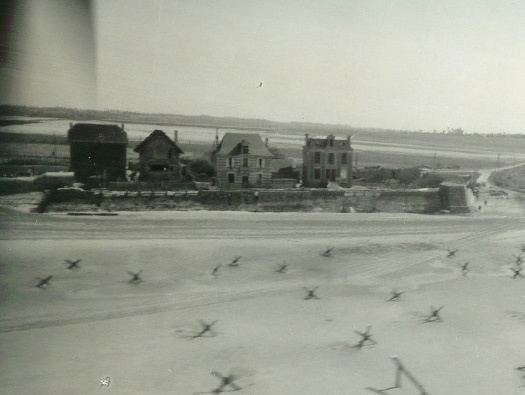 May 1944 and a USAAF P58 Lightening reconnaissance aircraft flying down the coast and photographing Gold Beach. 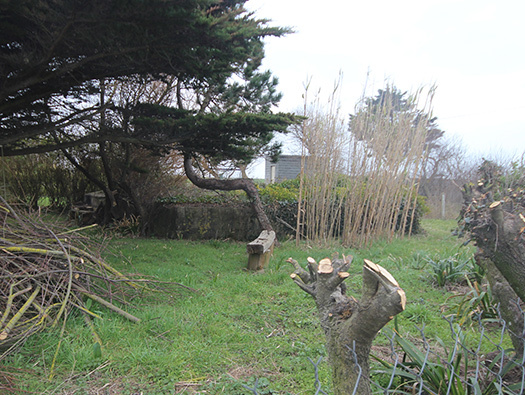 He has taken a fantastic picture absolutely spot on, the beach defences are being thickened up , the tank wall has been built (left side) and the Nr. 1694 has its concrete cover over it. 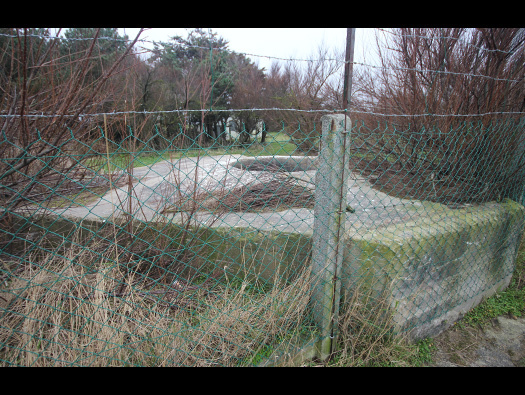 Four houses in place but now they have all gone, either removed by the Germans to use for extra defence or blown up in the battles for Wn38..
Mortar fitting inside a ringstand. Ringstand 5cm le.Gr.W.36 mortar in mirror image. Ringstand 5cm le.Gr.W.36 mortar. 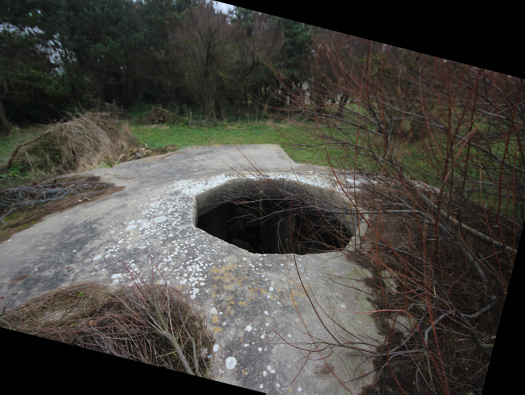 the entrance into the mortar ringstand with a small ammunition room and the ringstand. 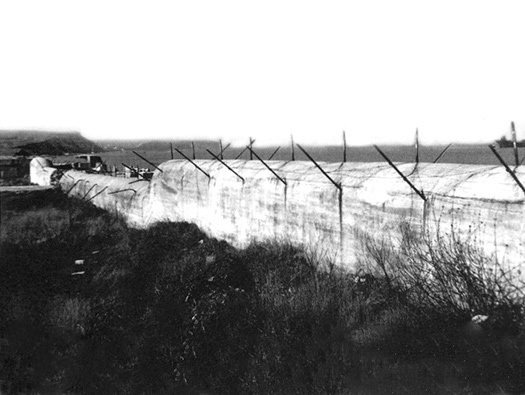 The anti-tank wall running along part of the coast, this may be where the houses were pulled down so the wall could be built. 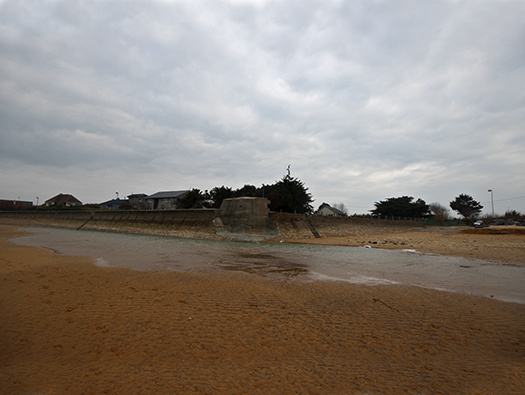 This shows the sea wall and the sea defences. 6th June 1944 and things change drastically. 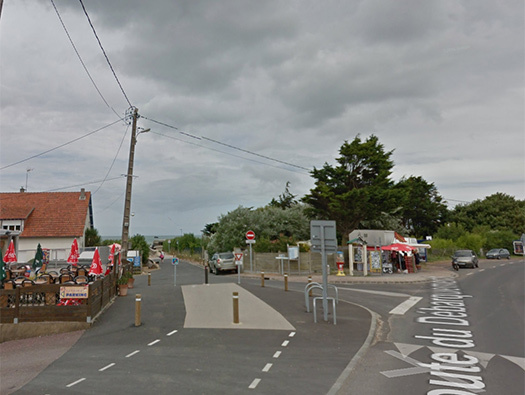 All building work in this part of Normandy stopped and every able bodied man went on the defensive. 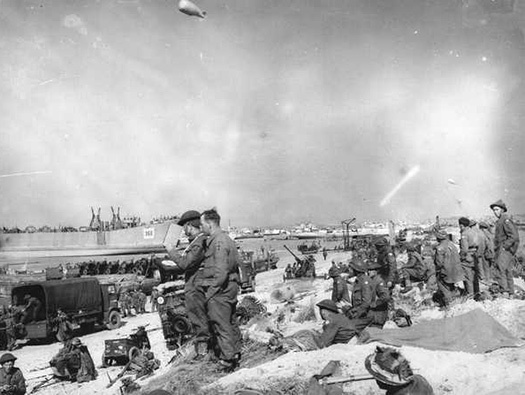 The allies attack started at around midnight with bombings, parachute drops and ship to shore artillery. At 6.30am. 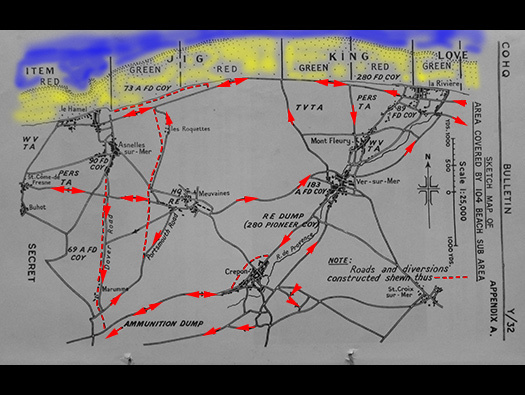 the 231st Infantry Brigade started to land not exactly where it wanted to but due to wind and weather plus other problems which always happen in the heat of war, they gradually moved east with the tide taking them away from Wn38 and Wn37 to around Jig green and Jig Red. 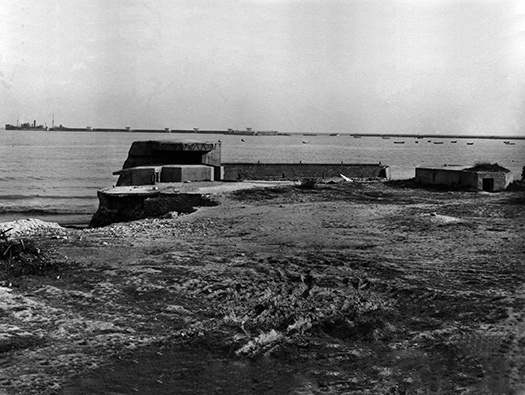 The defence guns at Wn39, 38 & 37 had not been destroyed in the bombing and all came alive and started to attack the landing craft coming in. 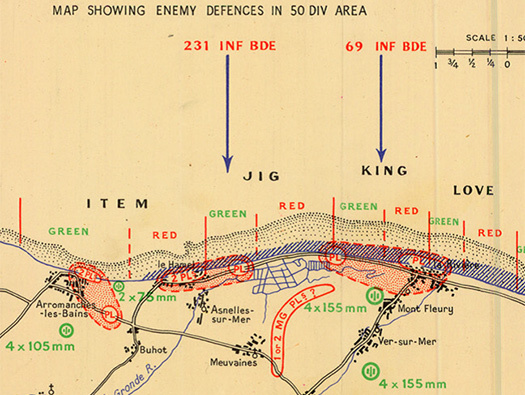 An Allied Bigot map of Wn38 showing what they thought were the beach obstacles and defences. 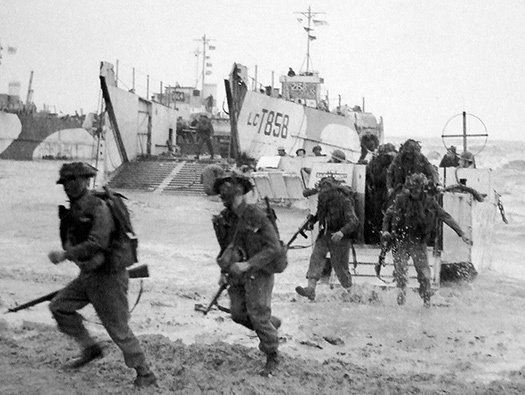 Jig Green, Gold Beach 50th div troops running a shore. 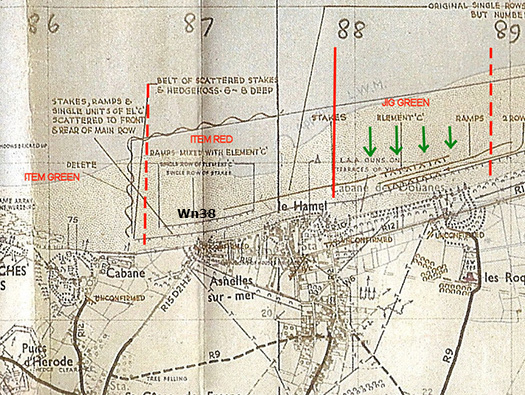 The troops landing landing had to assault Wn37 first and than worked their way around the rear and attacked from inland. It took almost the whole day to gradually wear the defence down. A good read is a new book 'The D-Day Landing on Gold Beach'. by Andrew Holborn. He also has another book '56th Infantry Brigade and D-Day'. Painting of the Royal Hampshires. 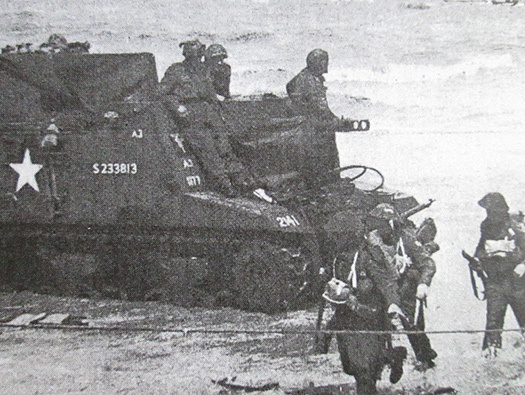 Sexton 25lb'er mounted on a Sherman chassis was used to fire on beach targets on the run into the beach and when landed continued on to support the infantry and armour. Sexton's firing on the run in to the beach. The beach has now been taken and this could be D-Day + a few days. 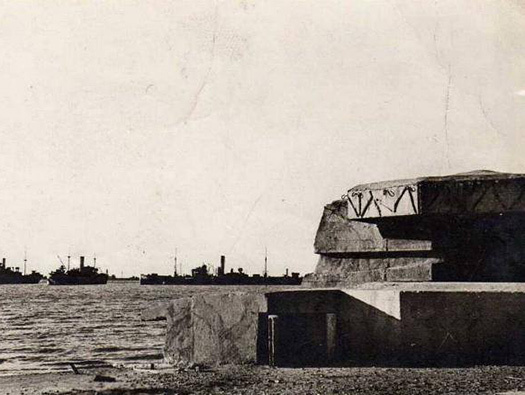 A Bofors anti-aircraft gun is set up on the beach, large Tank Landing Ships now unloading directly onto the beach. 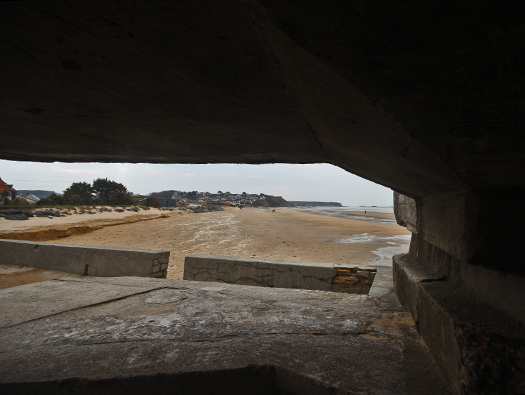 The view from Wn37 along the whole front of Asnelles-sur-Mer. 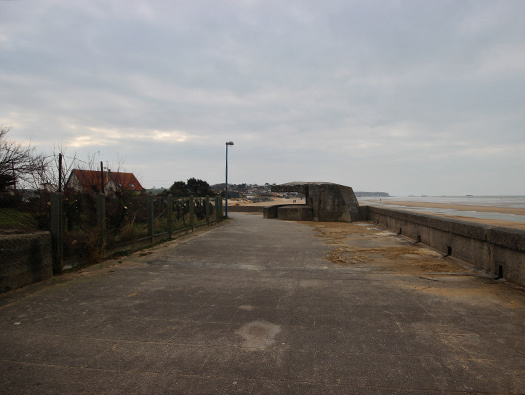 The large anti-tank wall has now been breached so that vehicles can come and go off the beach and a roadway built up to take them. Phoenix caisson with a Bofors gun on the top. 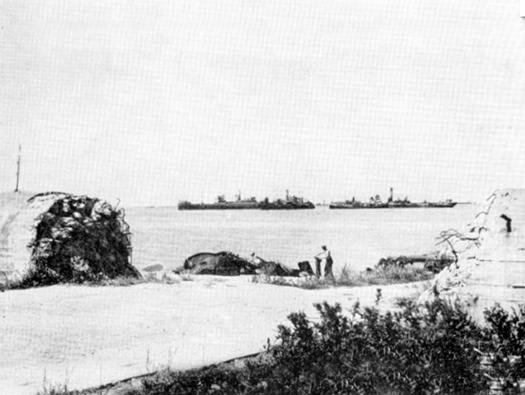 Tanks landing across the harbour. 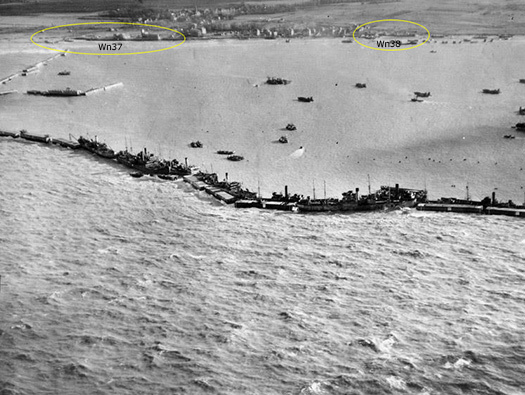 As the landings were taking place on D-Day, ships were also leaving British ports that were war worn and of no use to trade. They were sailed across and sunk in long lines in many places along the coast to act as breakwaters for the Mulberry 'B' ('B' British, 'A' American). Then large Caissons followed on and they were pulled by tugs and sunk to also act as breakwaters. 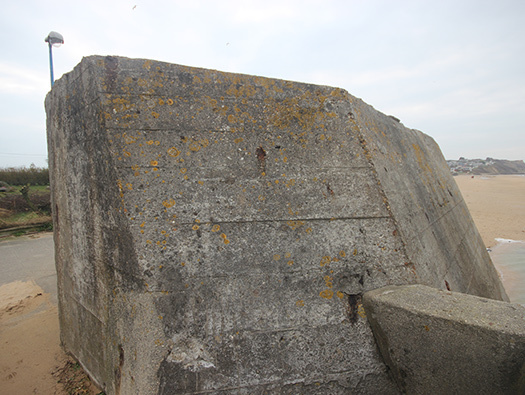 Also on some they had Bofors towers fitted and the AA guns protected the fleet. After the Caissons the floating roadways came over and linked the beaches with large floating docks to offload in deeper water. 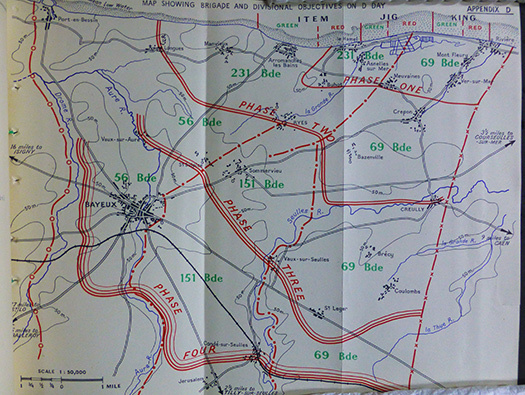 This is an Engineer plan of the area after D-Day showing the new road network laid out by the Royal Engineers. 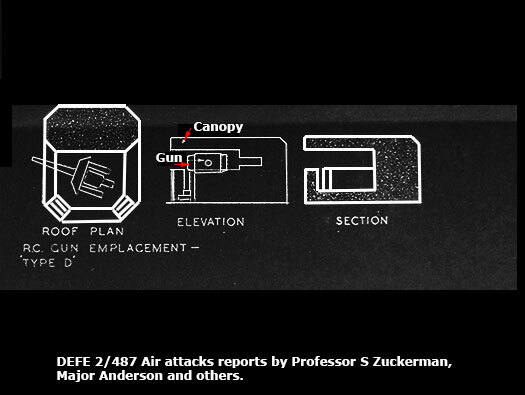 This is the plan for 'Phase Lines' of how the attack was planned. 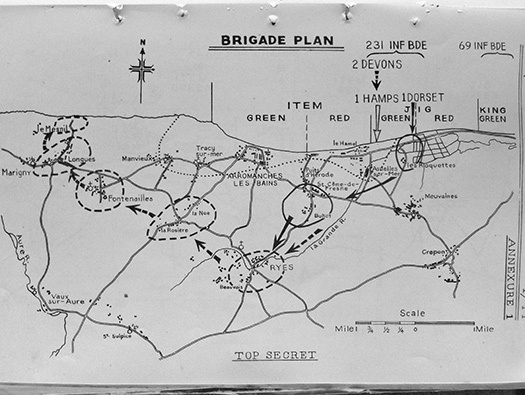 This is the route and attack by the 2nd Dorset Regiment on the attack of the Longues batterie. 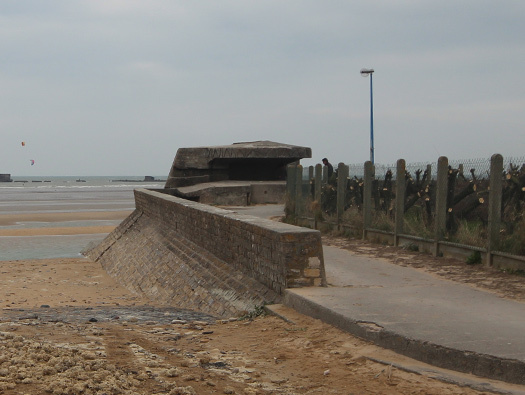 That and the Commando attack on Port-en-Bessin are two of the most dramatically important advances next to Pegasus Bridge, but very little is talked about them.